Matt Gibney has only a fortnight remaining as a Villanova student. He'll be returning to his native Australia at the end of the semester to pursue both an Olympic berth and a medical career. Even though his stay at Villanova was a brief three years, he contributed mightily to the regeneration of the men's program, and for that Villanova fans should be thankful. 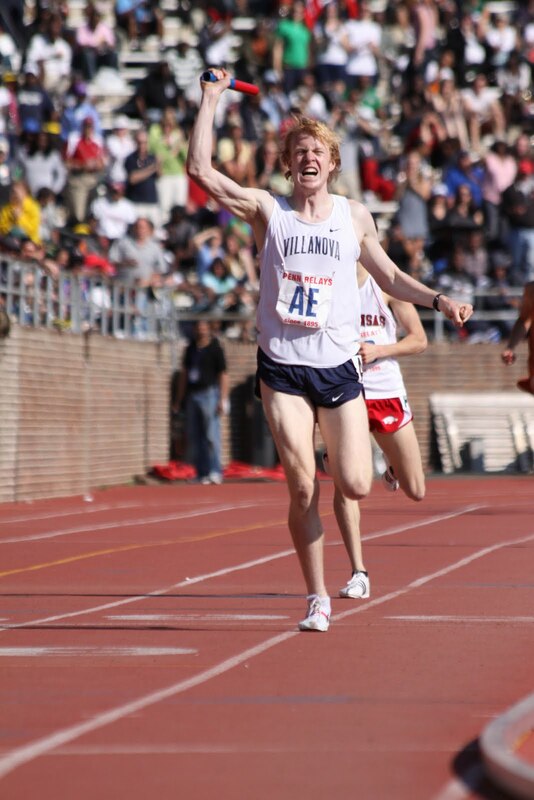 He will probably be best remembered for his two stellar DMR anchors at the Penn Relays, on a stage as big as they come for a middle distance runner, and a stage that applies massive pressure to Villanova athletes. When he arrived on campus in January 2009 coach Marcus O'Sullivan is reported to have told him "Just give me a good mile at the Penn Relays" -- a request that Gibney fulfilled with flying colors (ginger, in this particular case: see photo on right). 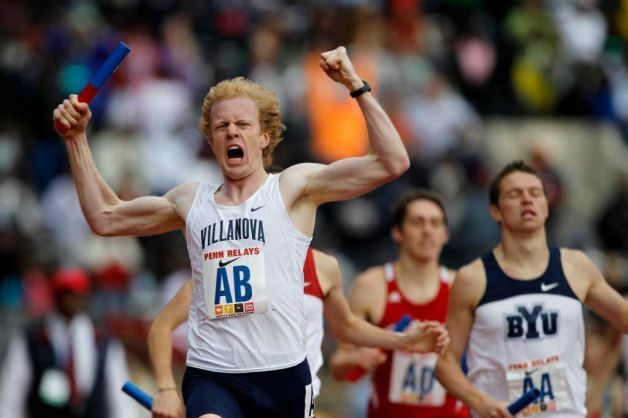 He anchored the DMR to Villanova's 23rd Championship of America in that event. He repeated the feat in 2011, helping bring home a 24th COA wheel (see photo above). Matt was a multiple All-American, broke the 4:00 minute barrier in the mile, performed his best on the biggest stage at Penn, all the while excelling in the classroom: Gibney in 2011 was Villanova's first men's Capital One Academic All-American since 2007. Villanova Running wishes Matt good luck in his pursuit of a spot on Australia's Olympic team for 2012 and in his future professional endeavors.